Down Grapevine Lane: Lovely Little Patchwork Blog Tour + Giveaway! Lovely Little Patchwork Blog Tour + Giveaway! Welcome to my stop on the Lovely Little Patchwork blog tour! I'm so thrilled to be a part of this tour celebrating the first book by Kerri Horsley (of Lovely Little Handmades / Sew Deerly Loved fame), whom I have been following since I started sewing back in 2012. Her style is so unique and inspirational - in fact she is one of the reasons I took up sewing in the first place! This book is packed to the brim with eye candy and publishers Tuva (who are also publishing my first book Quilt Petite!) have done an amazing job of mixing Kerri's gorgeous photos with water colour illustrations. So yummy! So much so that I found it really difficult to pick just one project - hell, I wanted to make'em all! After much toing and froing, I settled on two projects. 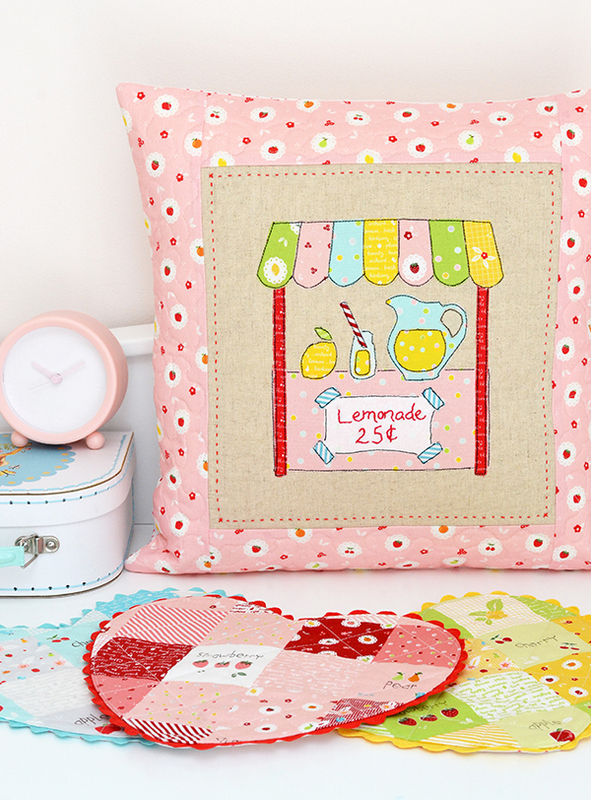 My first project was 'Lemonade Jug Rug' which I turned into a cushion using my Sweet Orchard fabrics. They were a perfect match with their fruity theme and vibrant colours. Those visiting my booth at the spring quilt market may remember this cushion which was part of my display there. I had the pattern printed and sitting on my desk for a week before I made the cushion. So even though you are supposed to flip the templates when making the applique shapes I'd got so used to this mirror-image version that I just decided to replicate it as it was. 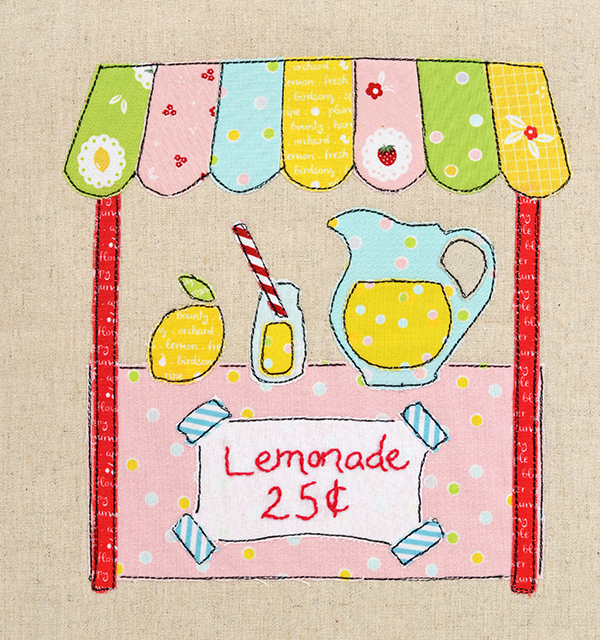 I love how well the yellow dotty print works as lemonade and the red bias stripes are perfect for the straw. For my second project I made the 'Heart Coasters' in three different colours. And guess what - I totally cheated here, but isn't that what cheater prints are for? Seriously these took no time to make at all, as I didn't have to do any patchwork. I enlarged the heart template in the book by 25% to make it a better scale for the cheater prints from Sweet Orchard, so my coasters are more of a mug rug size. Here is a full schedule of the tour so you can visit the other makers to see their fabulous creations. You can also follow along on Instagram with the hashtag #lovelylittlepatchworkblogtour. Thank you for visiting! This book looks so fun. I love your makes. They are beautiful! So, SO cute! Thank you so much for the chance to win this wonderful book! Beautiful book Sedef! Amazing pillow! Thank you for the chance to win this book! beautiful book and fabrics collection, what a perfect combinations .. the lemon stand is in my must to do List ... gorgeous ..gorgeous.. gorgeous..
Love your pillow with the cute lemonade stand applique...and your heart mug rugs - so beautiful with your fabric and ric rac added!! I keep telling myself I.do.not.need.more.fabric, but when I see your new line, I keep imagining all the lovely quilts and projects I 'need' - 'would like' to make with it :)!! I just love it! 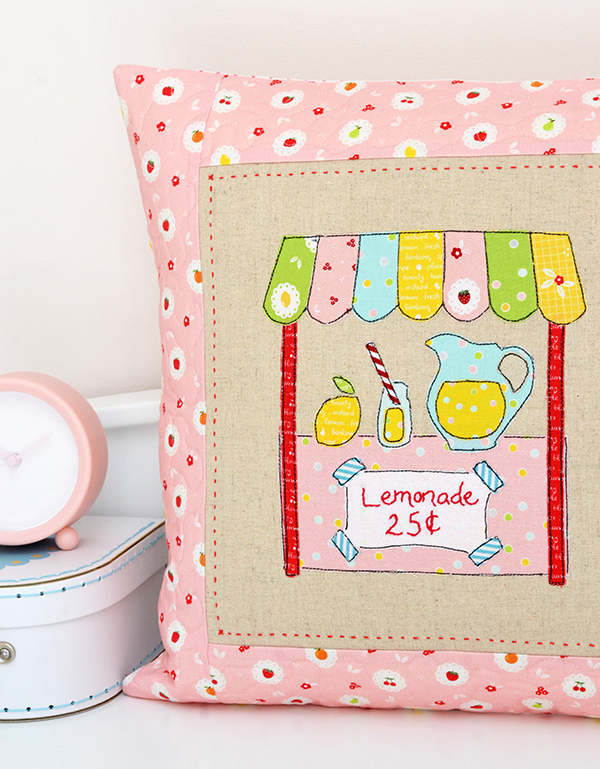 That cute little lemonade stand pillow is so sweet! I am super intrigued with this book, looks like something I really need for my quilting library. Thank you so much for showing us your pretty things :-) now I really want to try to make things from this book! Looks amazing! Such pretty coasters, thanks for the opportunity to win the lovely book. Your heart coasters are the best!! Love the lemonade stand! Thx for the give away opportunity! Sedef, you always know how to inspire me. Enlarging those templates by 25% is such a simple, yet great idea to make something new just makes me shake my head and wonder why I didn't think of that! This looks like a super book I'd like to have in my hands. Pure cuteness!! Thanks for this opportunity!! Your fabrics are so perfect for these projects! Absolutely adorable! 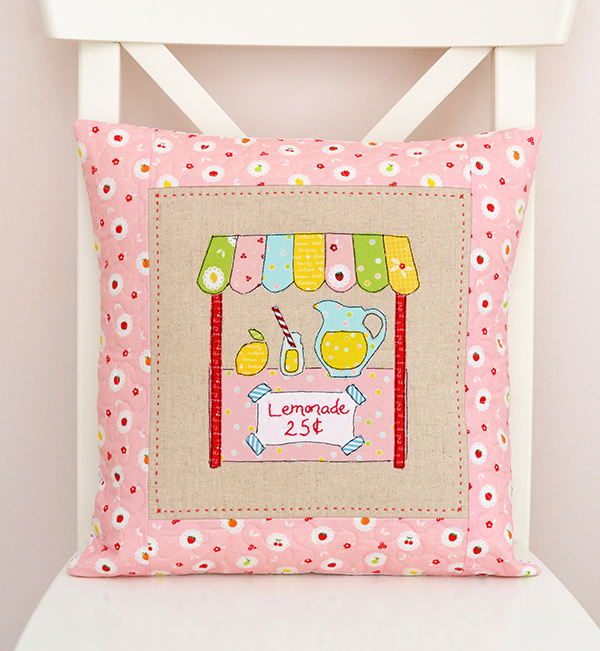 I love you lemonade stand cushion. Your Sweet Orchards line went perfect with it! It would be so fun to make some projects from this book! Beautiful makes, as always. Thank you for the opportunity to win the book. Wow your lemonade stand is simply awesome. I remember when my children were young, they had a kool-aid stand in front of the house. This is a really fun project. 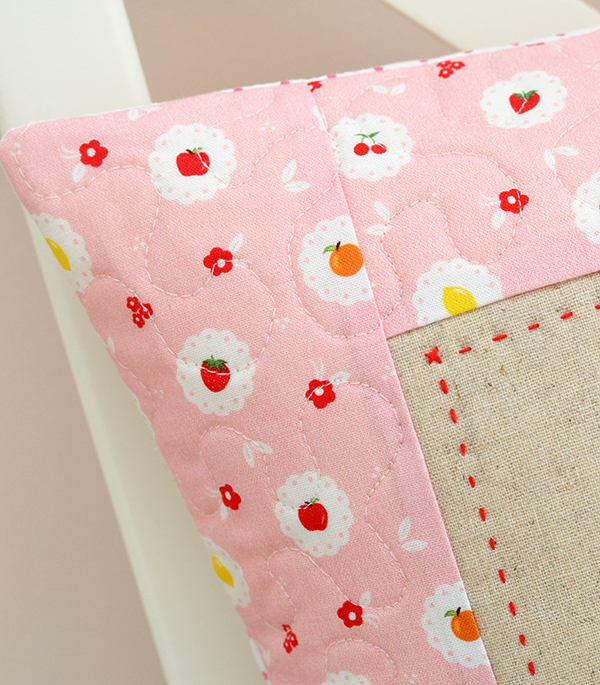 I love the cute fabrics and this sweet pillow! Adorable! I especially love the hearts. Love this fabric and wonderful book. HI,such cute projects! Thanks for sharing a neat Book Giveaway! Such lovely pretty designs. Thanks for sharing the give away. I love these coasters, such a gorgeous design and perfect in your beautiful fabric. I would love to win this book, I've seen such lovely makes from it on IG. So very cute. Love the lemonade stand. The coaster/mug rugs are so cute and happy looking. The pillow is adorable too. Fingers crossed! Such beautiful work! I would love to win. Thank you for the opportunity! What a fun giveaway - this book would be so nice to win! First thing I'd make is a set of those coasters! 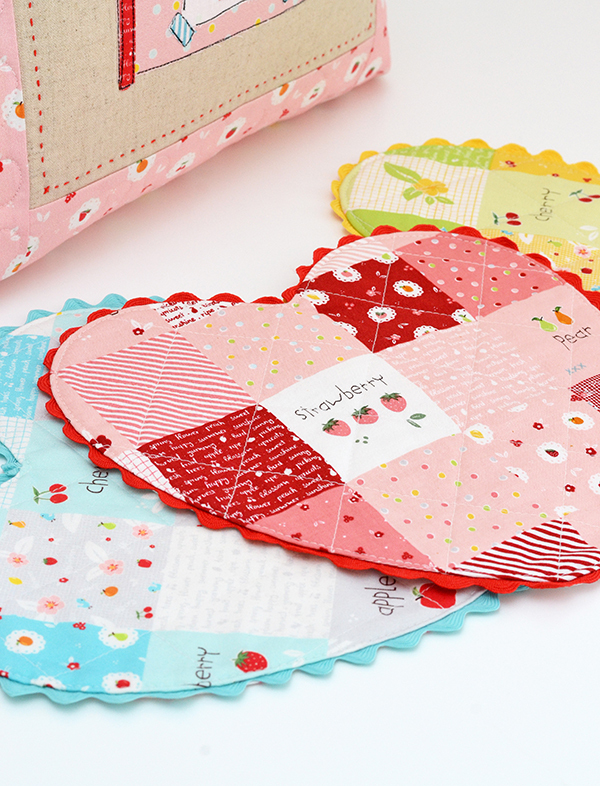 Adorable projects and you always pic the cutest fabrics! Thank you for the opportunity to win the lovely book! Sedef! These both are so cute! Love the fabric choices!! That book would be so helpful! Thanks for the chance! Love your projects!! Thanks for the fun! I'm sure my granddaughter would love to help me make items from this cute book! I've been eyeing this book for months! Your projects came out fantastic. Thanks for the chance. Beautiful projects! Great job! Thanks for the chance to win this book! Lovely projects. Thanks for sharing!!! Love your projects- and the book looks great! Delightful pillow--perfect for these last days of summer! And I love the cheater print mug rugs--the ric rac finishes them off just right. Thanks for a chance to win this book! Just too sweet for words. Awfully cute; I would love the book! 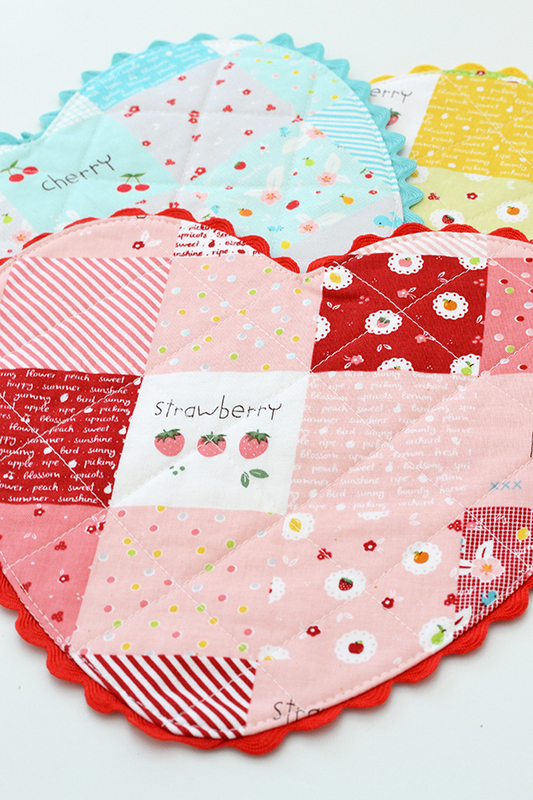 You're fabric choices are perfect for these projects! Oh I love your Sweet Orchard fabric! I've been a fan of Keri for a long time too, one of the first blogs I found! So glad to hear about her book. Thanks for the chance to win! 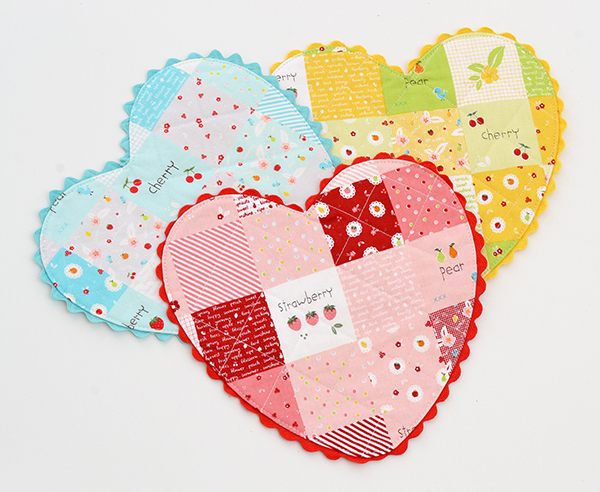 The fabrics you've used are amazing and I just love your heart shaped coasters. So many cute projects! Thanks for the giveaway! Yes!! I love this book!! I would love to make some of these special things for my friends and family. I would be very busy. All of the projects shared have been phenomenal!! Just incredibly neat beautiful work. So adorable. :) Thank you for having this giveaway! Your work is perfection!!! And what beautiful fabrics!!! I am so in love with the lemonade stand!! Such a cute idea to use it for a pillow!! And the coasters are just as cute-the fabric makes them even cuter. Thanks for the giveaway! Such a precious lemonade stand! What a darling little book! And I love your lemonade stand and coasters. Thanks for your generosity. Love all the things you make. I would love a copy of the book, that cushion you made is so cute. I agree the yellow for the lemonade was perfect. You did a wonderful job. Thanks for the giveaway. So sweet - love your work! What a cute pillow! I would love to win this book. Fingers crossed. loveeee the details you added on the projects. ohhhh goodie... giveaways. The colors. The fabrics. The projects. They just make my heart sing. Would love the copy. This is on my must have list! Love what I have seen from it. Would love to win a copy. What a great giveaway. I'd love to win this. Your pillow and coasters are just darling! Sweet fabric as well. Would love to win this book and make these projects. I have seen so many pretty things on IG using this book. I would love to win this giveaway! I loved your coasters on Instagram and totally missed that they are cheater prints. So clever and they look great!! Could I be so lucky? I've been following you since forever.Love your work. I hope I win this giveaway. Saira. India. This book looks so fun, would love to win one! As usual, your work is beautiful and your fabric makes it piece look so sweet! Love your lemonade stand and the book looks wonderful! Looking forward to buying your book too and your new fabric. Thanks for the chance to win! 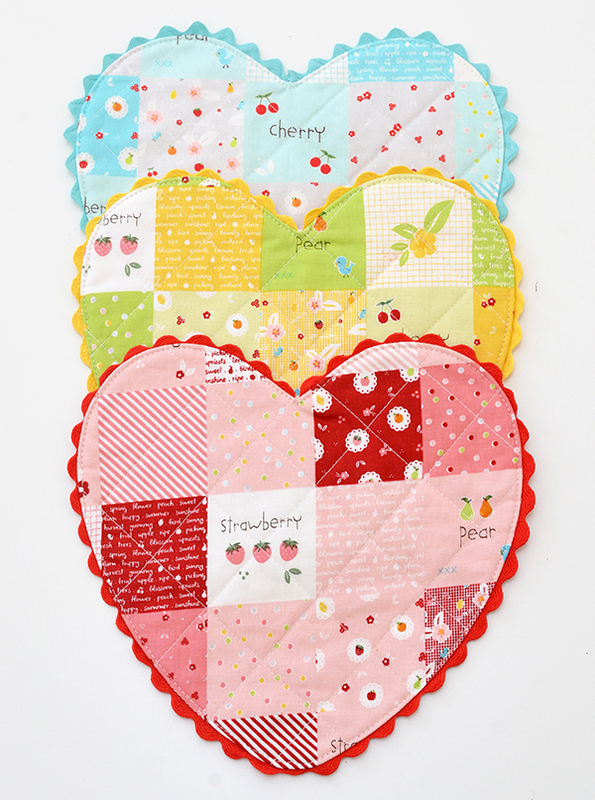 Quilt Petite & Sweet Orchard listed in my shop!